It was 2003, maybe, the first time a pretzel rolled out of Dressel’s kitchen. It wasn’t as much of a kitchen as it was a small room with some cooking equipment, several microwaves, a pot sink and a dishwasher. For 20 years the pub menu was produced by two cooks, one of whom carried the title Kitchen Manager. Not to say it wasn’t tasty, and well appreciated by the loyal clientele, but it was basic scratch cooking with a hefty dose of microwave sizzle. The now James Beard-lauded chef, Patrick Connolly (currently at his own Brooklyn establishment “Rider”), had recently left Dressel’s for a spell in Culinary school. His replacement brought in a talented sous-level cook to work on the line and it was him who first introduced us to the concept of the pretzel, as we now know it – a sort of hybrid braided loaf of doughy goodness served hot out of the oven with a cup of equally yummy Rarebit sauce. The ultimate craft beer drinkers snack! Originally the source dough was made up of pizza shells re-worked, somehow, into braids. My memory of this is vague and the product surely suspect. At some point we made the jump to ordering fresh dough from a local baker, Vitale, on the hill. 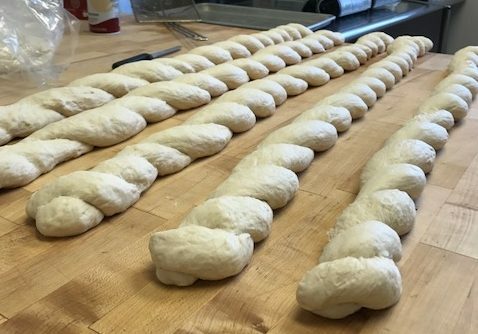 Generations of cooks and chefs at Dressel’s have had the sometimes burdensome, but ultimately satisfying, task of “rolling the dough”. In fact you can add hostesses and owners to that list. It’s a tough love that requires patience and the better part of a day to produce enough pretzels to keep the now-devoted following happy. During our Diners Drive-Ins and Dives’ heyday it became an almost full time job to keep up with this one menu item’s production. There have been times that I have considered finding an excuse to let it go, as was suggested by more than one unhappy chef who found themselves rolling the dough as a result of poor delegation decisions. During this busy holiday season I found myself once again cozied up to the dough table doing the rolling to make sure we didn’t disappoint anyone New Years day. It’s kind of like riding a bike and, frankly, quite enjoyable in its meditation. Playing with the format got me wondering about change and how to evolve what we do to best suit the needs of the business and the customer. The thing I’ve always despised about the pretzel is what do you do with yourself after your appetizer has laid waste to your appetite? Folks have complained about the $10 pretzel, but it feeds 4 people, for goodness sake. Perhaps it’s time for the $5 pretzel? – I thought to myself while twisting out a pretty little figure eight for two. I’m pretty sure the chef and whoever is rolling the dough might agree: sometimes business and love are a marriage of compromise. Happy New Year to All and Best Wishes for 2018.